Discover Cebu which is also known for their historic places, beautiful heritage churches and museums by traveling to its southern part. 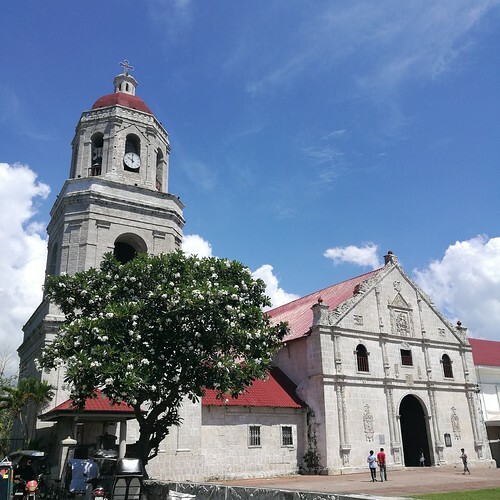 I may have been to Cebu City a few times before but not yet to these significant towns that we went to or even passed by during our second day in Cebu wherein we had a Southern Heritage Tour. Our squad from Davao (bloggers and vloggers from Davao Digital Influencers or #TeamDDI; our blogger friend Chito; our new media friends Ms. Judy and Sir Jon) is ready to chase more wonders on Day 2 in Cebu last April 23, 2017 with friends from PRWorks Ms. Van and Ms. Trysha, together with Ms. Punky Oliverio of the Cebu City Tourism Office. Ka Bino Guerrero of Galleon San Pedro Tours seated in the front passenger seat of the van was with us during the whole time we were in Cebu as our tour guide. Thank you Philippines AirAsia for bringing the squad to Cebu! AirAsia now flies twice daily from Davao City to Cebu. Aside from Davao, there are also flights to Cebu from Manila, Caticlan and Kalibo to make your wonderful summer in Cebu chasing wonders. Read about that here >> AirAsia Heats Up Summer With New Flights to Davao, Cebu, Boracay, Palawan and Clark. Also, read about our Day 1 here >> Davao Life In Cebu via AirAsia : Walking Heritage Tour by Galleon San Pedro Tours. 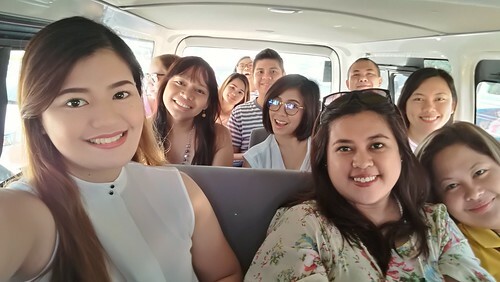 We were on our way to start Day 2 of our Cebu famtour after having a delicious buffet breakfast at Puso Restaurant in Quest Hotel & Conference Center. The hotel was our clean and comfy home during our entire Cebu stay located at Archbishop Reyes Avenue in Cebu City just right across the Ayala Center Cebu. Thank you, Quest Hotel! Hope to be back there soon! Side story: We passed by SM Seaside City Cebu on our way to our first tour stop in Carcar. No friends, this is not actually part of the tour. I have just been curious about this SM mall that looks like a big ship docked at the seaside if I may say, located in which they call SRP or the the South Road Properties where another branch of the Sugbo Mercado is located. 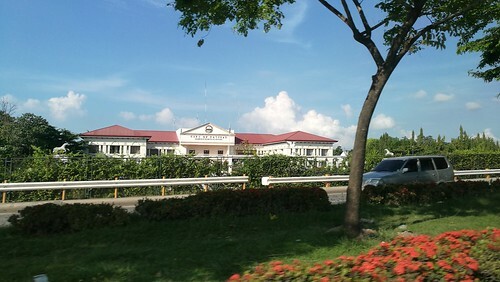 We passed by the new Talisay City Hall. I also noticed the large island they have in the middle of the road. It gives enough space ready for easier future road widening projects when the budget for the project becomes available without having to deal with people living on the roadside. Carcar was our first destination. It is named after a town in Northern Spain. 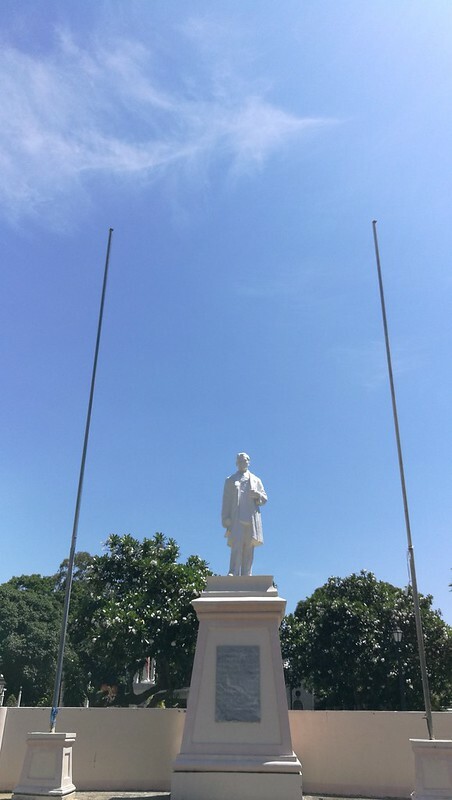 This place is known as the Heritage City of Cebu. You can find many structures from the Spanish and American era in this city. There are many very old houses or ancestral homes in this area such as this one in the photo above. 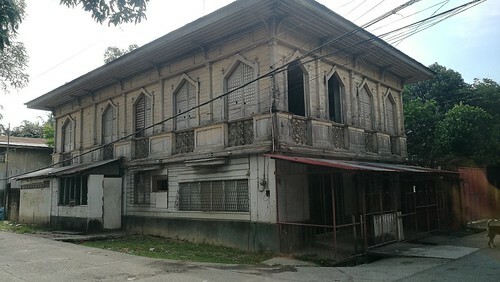 There are heritage houses that were preserved over so many years like the Balay na Tisa or the Osmena-Valencia House which is reportedly the oldest house in Carcar that was built in 1859. There is also the Mancao ancestral home in Carcar. We can only hope they get to be preserved as these homes will be good tourist destinations for those interested in revisiting how Cebu looks like in the late 1800’s or early 1900’s. 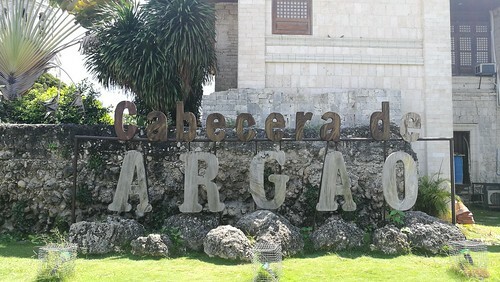 Carcar is also known as Cebu’s shoe capital. 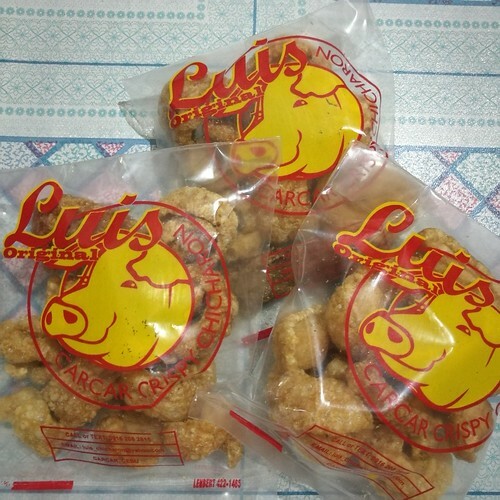 Aside from that, they are also known for their chicharon and of course what else but lechon Cebu! 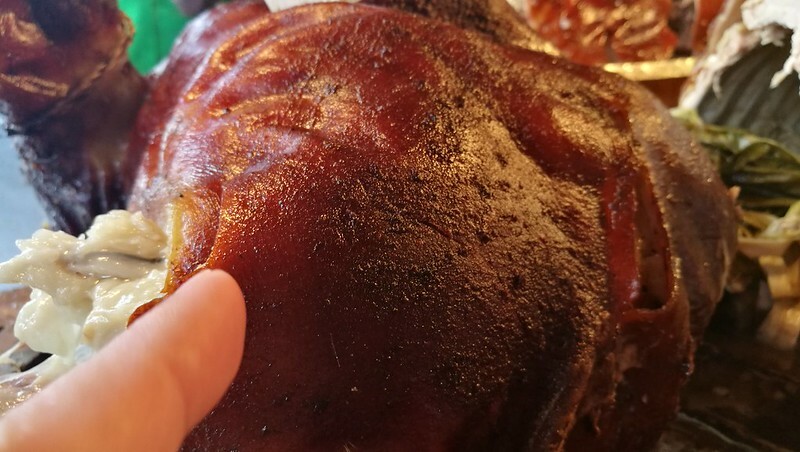 We made a stop by the Carcar City Public Market which brought us to lechon heaven! Click image above to see video. This is the first public market I have ever been to where you will find lechon Cebu all lined up in one section. Goodness this market has so many temptations honestly to cholesterol indulgence. There are carenderias nearby selling other food and puso rice which is popular in Cebu and perfect to eat with your hands, kamayan style! I was successfully able to resist even tasting their sample as many of the friendly vendors were calling out to me to try their lechon as they were assuming I was there to buy with our friends. I really wanted to sample, but I could not anymore. After not feeling well inside and getting really dizzy while we were having a great dinner with our group at Sugbo Mercado the night before, I told myself I wanna go home from this trip without any need of medical attention and I wanna continue on with the tour till the end. 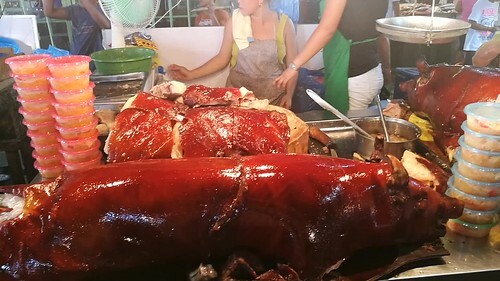 But then you’ll also later find out in this whole trip that I was not totally able resist it and gave in to indulge in lechon! Find out in my next post when we had Cebu’s famous Rico’s Lechon for lunch before our hike to Gining Falls! 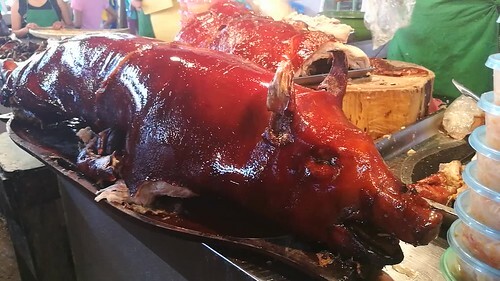 We were there at the Carcar market just to get cholesterol – free lechon, as Ka Bino would put it, by simply taking photos and videos of the tempting and delicious looking roasted pigs all displayed in a section of the public market. 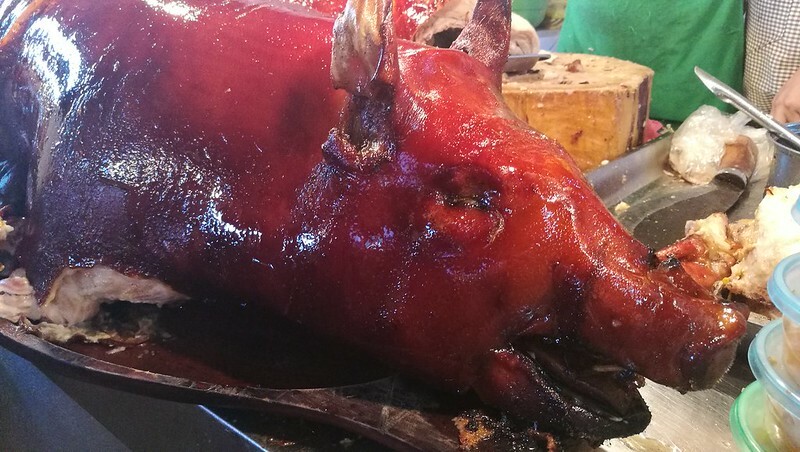 Well like Anthony Bourdain who hailed lechon as the best pig ever in one of his No Reservations episode, we too Filipinos all love lechon, which is a star in the fiesta spread on the table of most Filipino homes when there are special celebrations in particular. 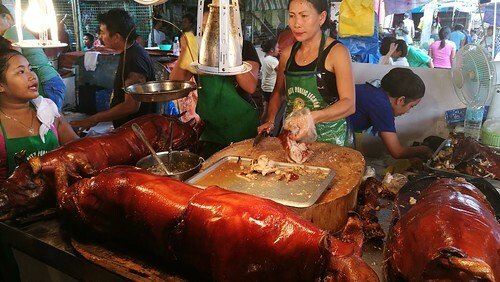 I am happy to see this part of Cebu known for their lechon and the ‘sabaw’ of the lechon that Ka Bino was telling us about. 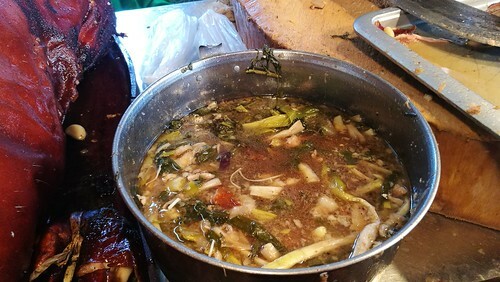 I saw one vendor scooping the juice from the lechon and putting in this big bowl. They really save the ‘sabaw’ from the lechon as some people like having their lechon with it. I haven’t tried eating it that way yet in my entire life. Carcar is also known and famous for their crispy chicharon with laman or what I think they call here as special chicharon. I realized it was a pasalubong that was in ‘demand’ when friends knew we were in Carcar. On our way home at the later part of the afternoon, we passed by Carcar again and the van made a stop so we can buy Carcar chicharon for pasalubong. Unfortunately, I left my money in my other bag in the hotel and I was only able to produce two hundred but then someone borrowed one hundred so I only had a hundred left. Good thing they have this three small snack pack size for P100 worth of chicharon. Side story: From Carcar in the morning, we passed by Barangay Simala. Earlier we were told we might be able to go which made my heart ecstatic at the news. But since we had little time and schedule was tight for the day and understandably we had a long way to go, we won’t be able to. Well with AirAsia’s two daily flights from Davao to Cebu, we may go back next time. I have always wanted to visit the Monastery of the Marian Monks of the Eucharistic Adoration located in Simala, Sibonga. Popularly known as Simala Shrine or Simala Church, that looks like a castle located in Marian Hills of upper Lindogon, Simala, Sibonga, Cebu. The Simala Shrine was built in 1998 by Marian Monks from Pampanga. Friends who’ve been to Cebu have been to Simala and I would often request for them to light us a candle. I’ve heard of people who would be taking board exams going there to ask for perhaps a miracle or help from Mama Mary. I wanted to pray there for healing aside from seeing this beautiful shrine at the same time. Next time, Simala! Next stop was Argao which is close to the heart of our friend Ms. Van who was with us in this trip. 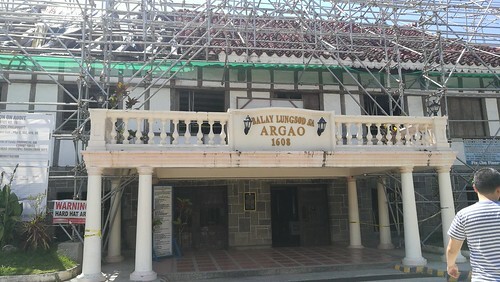 When we got out of the van, I saw the Balay Lungsod Sa Argao or the Town Hall of Argao. It is called Casa Real. 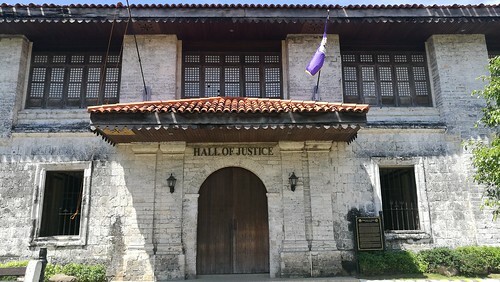 It is also the oldest town hall in the province of Cebu built in 1608. That’s more than four centuries old. I read that it is the only clay-tiled Spanish building structure left in Cebu. It was still under renovation though when we arrived there. 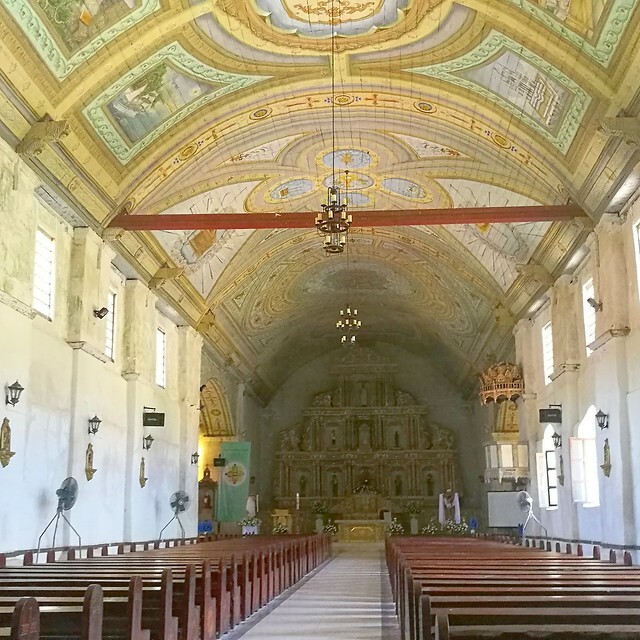 We went to the San Miguel Arcangel Parish of Argao. The church is more than two hundred years old or 283 years. 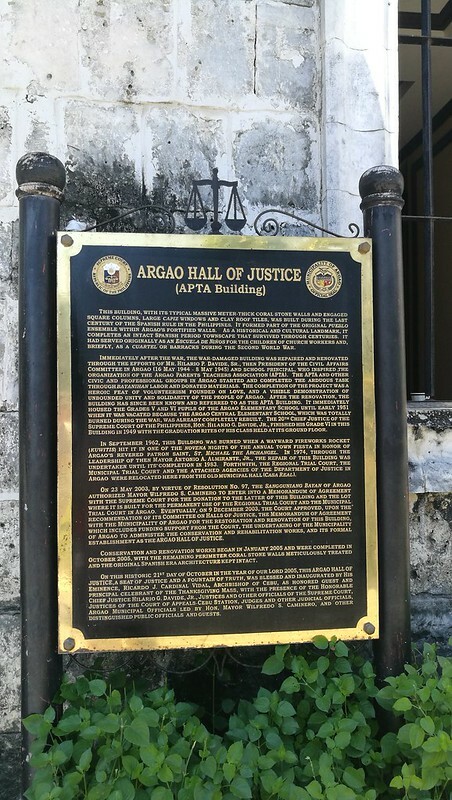 This church was featured in the movie trailer and opening credits of the recent KathNiel or Kathryn Bernardo and Daniel Padilla’s summer movie entitled ‘Can’t Help Falling in Love’ with aerial shots of the Argao church, the Hall of Justice nearby and the Argao plaza. That movie actually had many scenes shot in Cebu tourist destinations among those were two places we went to during our south heritage tour by the Cebu City Tourism Office on our second day of our Cebu tour. The name of the place somehow makes me think of Bohol, the neighboring province of Cebu. 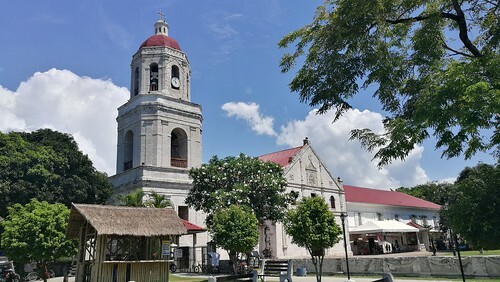 When in Boljoon, you surely wouldn’t miss seeing the Boljoon Church or the Nuestra Senora del Patrocinio de Maria Parish Church. The original church was built around 1600 but was destroyed in 1782. It was rebuilt the year after that with a stone fence protecting it. But then the fence was taken down when they built the coastal road leading to the town. It was also in the KathNiel movie ‘Can’t Help Falling in Love’. There was a scene from the movie showing them both facing towards the altar inside the church. When asked which is their fave place that they visited in this province when they filmed the movie in Cebu in January this year, they both answered in one interview – Boljoon which they find romantic and beautiful place as well as the Boljoon Church that is well preserved. 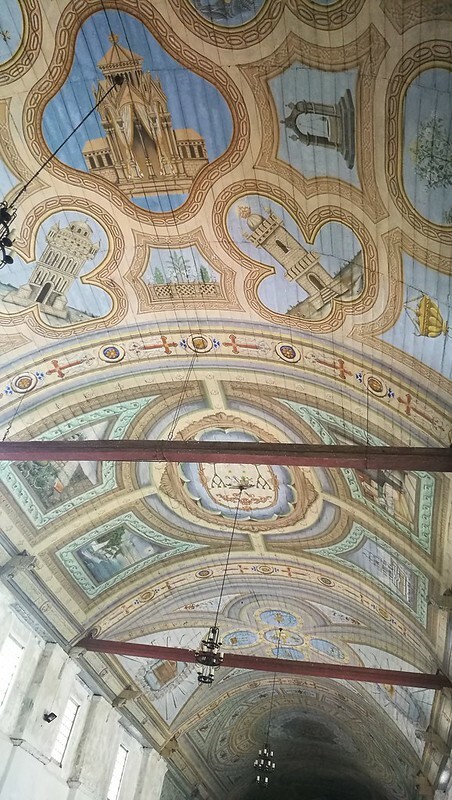 The artwork on the ceiling catches anyone’s attention when you enter this old church. The choir loft is still preserved at the top back of the church. There is a pipe organ in there that was preserved too but does not work or play anymore. 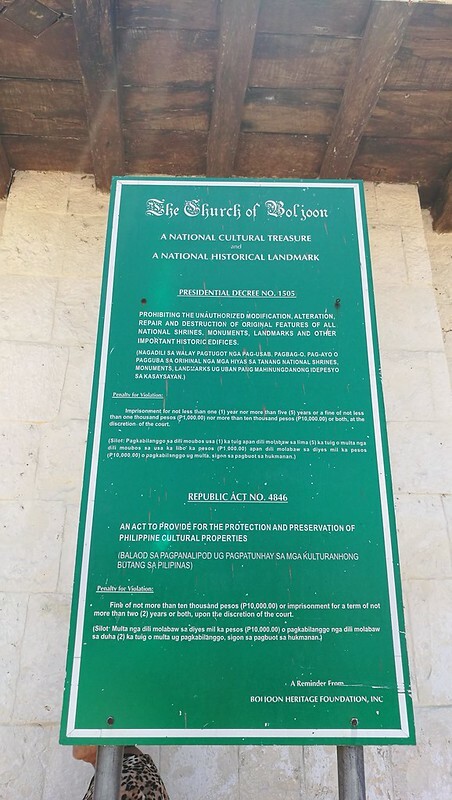 This fortress church has been declared a National Cultural Treasure by the National Museum of the Philippines and a National Historical Landmark by the National Historical Commission of the Philippines. 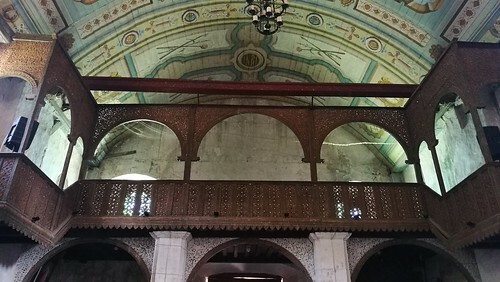 It is also under consideration for the UNESCO World Heritage Sites of the Philippines as a member of the Baroque Churches of the Philippines. 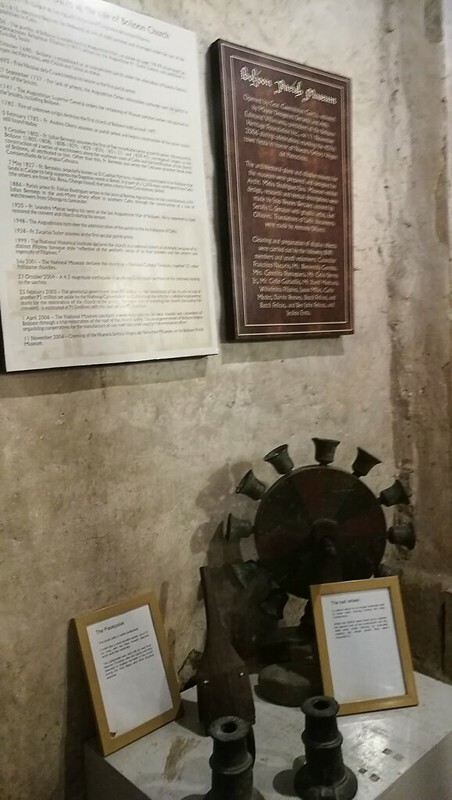 The belfry or bell tower nearby has only four of the original seven bells remaining. 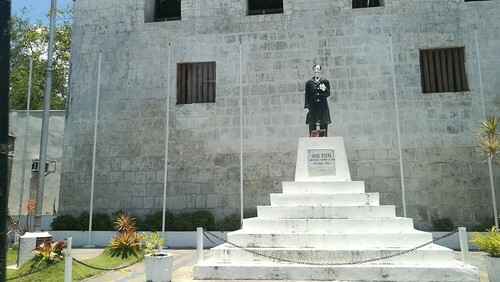 It was a two-level blockhouse facing the sea that now has a statue of Dr. Jose Rizal, our national hero in front of it. The structure is said to have walls as thick as one meter. 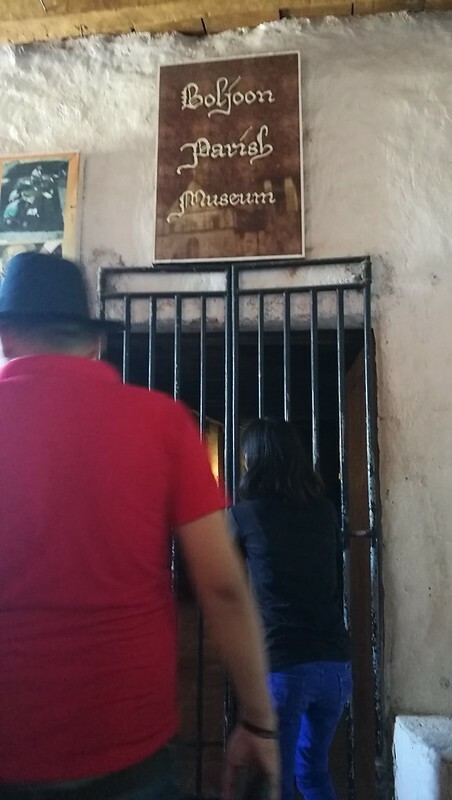 We also went in the Boljoon Parish Museum or the Nuestra Senora Virgin del Patrocinio Museum. I was able to take only one snap but we were asked not to take photos anymore once inside the museum. This was opened in November 2006 by then Cebu Governor Gwendolyn Garcia during their town fiesta. 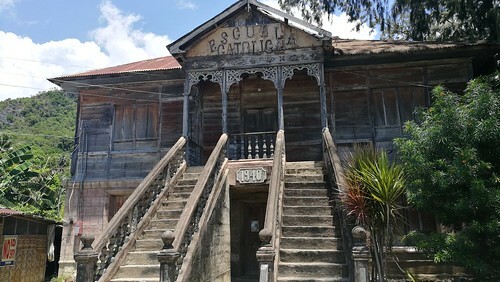 Near the Boljoon church, you will find this old wooden structure, the Escuela Catolica built in 1940 with two staircases. 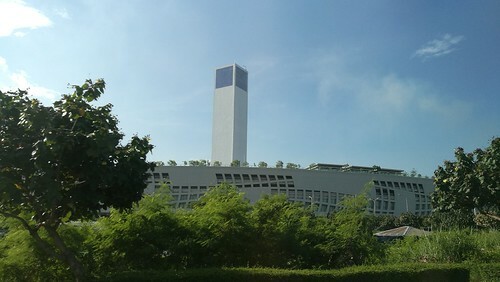 These days, it is being used as a meeting place by religious groups of the parish. I saw some women entering this building after the mass when we were there on a Sunday. Way back then, it served as a school for religious teachings and was a primary school. Over the years this place has become a popular tourist destination as it is known for the place to go for whale shark watching when in Cebu. I was looking forward to going to Oslob. When we got there, it was already past noon. Not even a slight chance as our van simply zoomed past by Oslob. Yes like the Flash, ok just kidding. There is always a next time anyway with Air Asia’s daily flights to Cebu from Davao. We were told that you have to be there in Oslob by 8AM departing from Cebu City around 4AM, in order to experience seeing the whale sharks or what they call ‘butanding’ in Barangay Tan-awan which is 10 kilometers away from the center town of Oslob. This whale shark watching started late 2011. Some tourists even dive and swim with the ‘butandings’ or ‘tuki‘ in Visayan. We all just have to keep in mind that we have the responsibility to protect these creatures and keep their environment clean to avoid any whale stranding from happening for them to thrive and survive.